Choosing the right material for your fence can be a big decision. 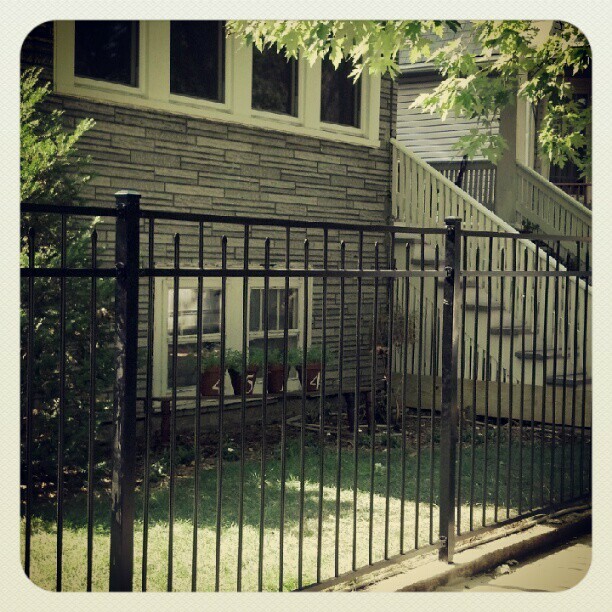 There are 3 main material choices you have for a residential fence. Below is a chart outlining the benefits of each. Obviously, since we manufacture vinyl and ornamental fence we are biased towards these two materials. Having said that, some people prefer wood because of the initial up front costs or natural look. If you’re choosing wood because it’s initially cheaper, keep in mind that maintenance over the years will add considerable expense (check out this vinyl vs. wood true costs infographic). If you prefer the natural look and don’t mind the maintenance, by all means, we respect your tastes! 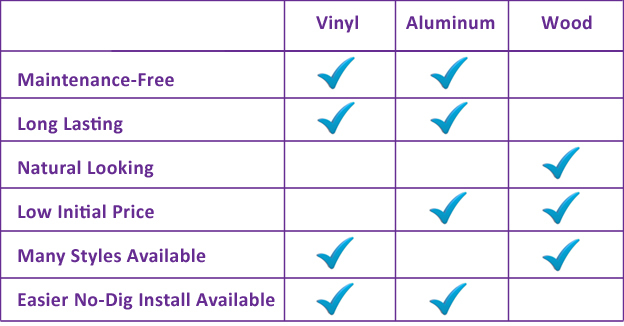 We’re going to assume if you keep reading that you are choosing between vinyl and aluminum. Each has it own benefits and considerations. What’s the Primary Reason for a Fence? 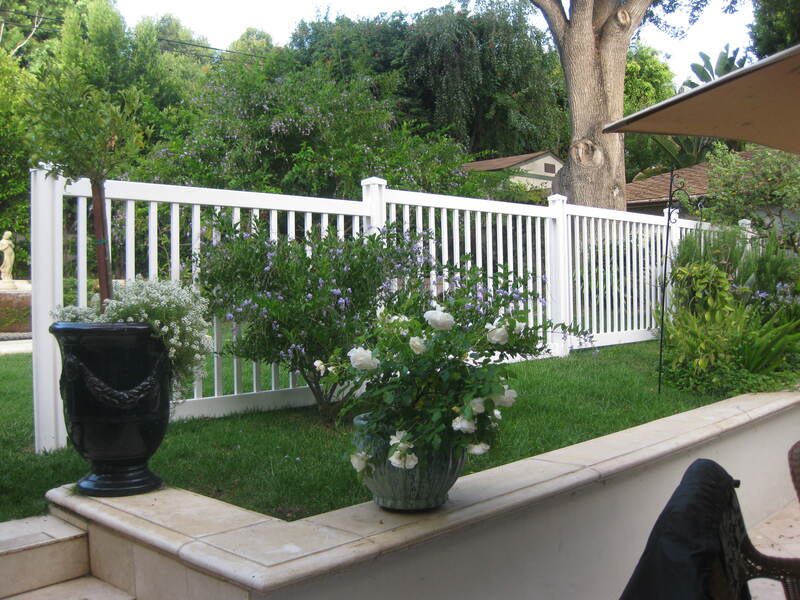 If you need a fence for privacy, vinyl is the default since you can’t get aluminum privacy. 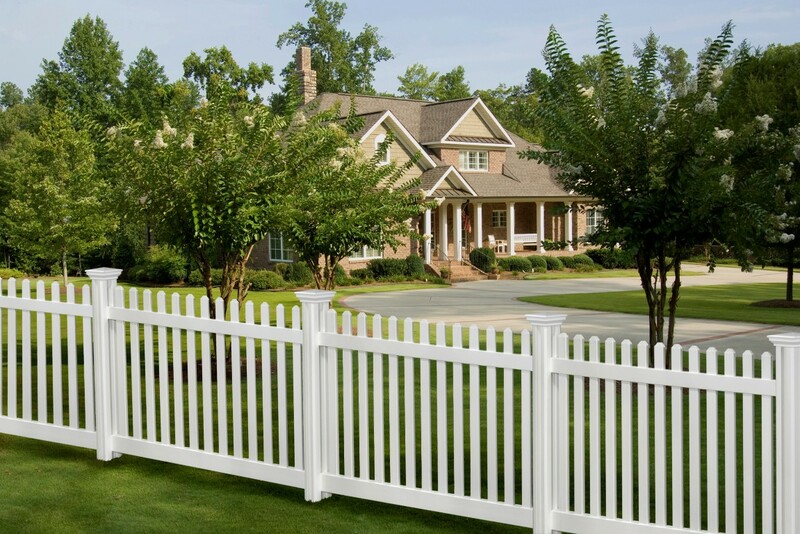 The same is true with ranch rail or a traditional picket fence. The only time you really have to choose between vinyl and aluminum is for 4-5 feet tall open perimeter fence. 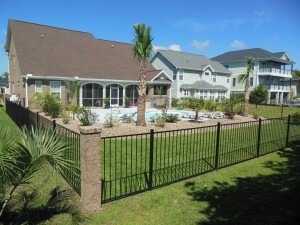 This style of fence is mostly used for pools, setting up boundaries on your property, or keeping pets and children safe. If this is what you need, keep reading for more tips on choosing vinyl or aluminum. If you’re after the classic picket fence, you’ll need to go with vinyl. 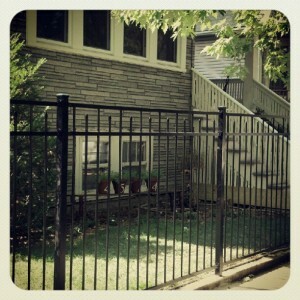 Our vinyl fence is white and our aluminum fence is black. If you have a color preference either way, this may be the deciding factor. Some customers prefer white because it compliments their house, and some prefer black because it can look more subtle. 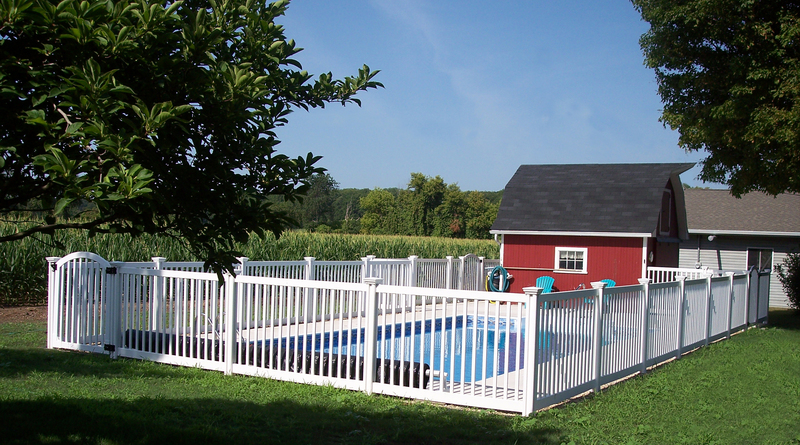 This vinyl fence looks terrific with the white trim on the shed. 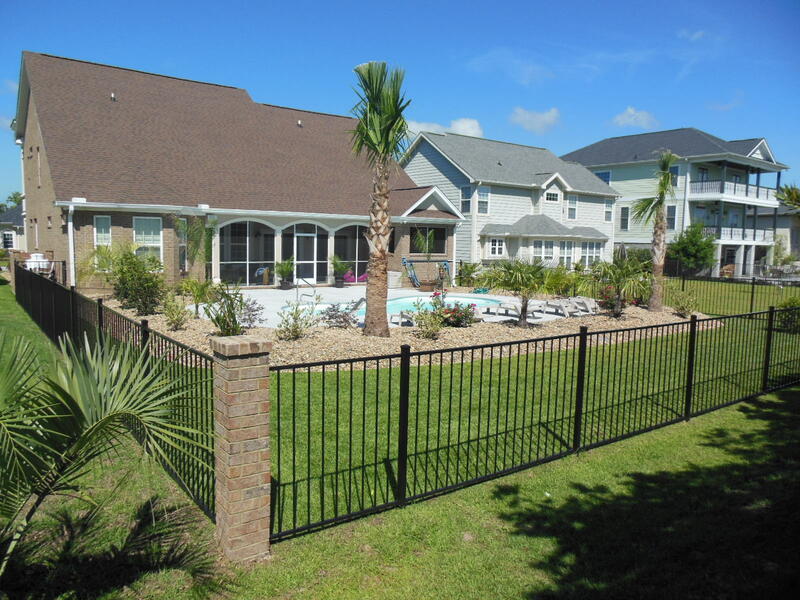 This southern style home looks great with our aluminum fence affixed to stone pillars. Aluminum is generally more subtle and blends into landscaping, where as vinyl is more obvious. Some people enjoy the look of a vinyl fence because from 5ft away it looks like freshly painted wood, or it can match the shutters and trim of the house. Vinyl posts are usually thicker and more substantial (4-5in.) and aluminum posts are quite a bit thinner (2in.). The overall style difference between aluminum and vinyl is quite significant, and much of it depends on personal taste. Have a look around your neighborhood and pay attention to what material is prevalent. If all your neighbors have vinyl, you really should consider vinyl so it looks uniform to the other houses on the street. The same is true with ornamental aluminum. If you live in a New England style home with shutters and white trim, vinyl will often compliment it best. If you live in an area with black shutters and dark home colors, aluminum might be the natural choice. Again, looking around your city to see what your neighbors are choosing will also help you decide what fits best. Though the trim on the house is white, the black fence provides a classy pairing with the gray brick on the house. Choosing the fence material for you can be a big decision, but once you weigh all the considerations, the answer usually becomes more clear. Often it boils down to personal taste. Don’t forget that your friends at WamBam are always available to help walk you through the process as well. Installing a fence is a big job. Fortunately, WamBam makes it much easier with the no-dig approach. But it still doesn’t mean it’s easy. Hand’s down, the most labor intensive part of installing your WamBam Fence will be driving the pipe into the ground. We’re always looking for ways to make our customer’s lives even easier, and we’re pretty excited bout the new G20 by Skidril on the market. Our intentions are to have these as a rental option for the spring of 2013. If you’re considering a vinyl or aluminum fence and you want to take the easiest install route, give us a call to see how this handy tool can make your vinyl fence install that much easier!